The announcement of the death of Miss Minnie Frobose on Sunday morning came as a distinct shock to the relatives and friends. Although she never enjoyed sound health, her end was not expected. 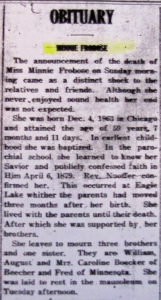 She was born Dec. 4, 1863 in Chicago and attained the age of 59 years, 7 months and 11 days. In earliest childhood she was baptized. In the parochial school, she learned to know her Savior and publicly confess faith in Him. On April 6, 1879, Rev. Noeffer confirmed her. This occurred at Eagle Lake whither the parents had moved three months after her birth. She lived with her parents until their death. After which she was supported by her brother. She leaves to mourn three brothers and one sister. 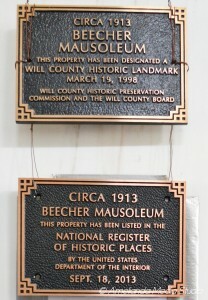 They are William, August and Mrs. Caroline Boecker and Fred of Minnesota. 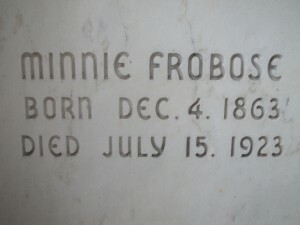 Minnie has no immediate family resting in the mausoleum, but many are distant relatives. This entry was posted in Automated Burial Listing, Burial Listing, Burial Location, HEADSTONE, Obituaries- Have Full Copy, St. John Evangelical Lutheran Church - Eagle Lake by Sandra. Bookmark the permalink.